The phenomenal rise of the street food scene over the last few years has taken London by storm. From the juicy burgers of Mother Flipper, made from chuck steak and cooked medium only, served with maple fried bacon on a half brioche roll with all the trimmings, to the outstanding Breddos Tacos and their slow cooked short rib soft tacos, this is serious street food. There are now companies such as Kerb and Street Feast involved in bringing together and organising various high quality vendors, arranging mini food festivals all around the city on just about every day of the week. Long gone are the days when street food meant greasy sausages and over fried onions from dodgy and often illegal vendors trading in the West End. Of course that option is still available, if you’re drunk enough, but if you’re after something a little more palatable, the choices are impressive. There’s also a move from the “fairground” style trucks with extensive menus of 20 or more items. What we see now is the emergence of single product specialists. This new breed for vendors dedicate themselves to an ethos of authenticity and absolute quality, developing every element of their dish, from farm to fork, to ensure it is a faultless replication of an authentic classic or something truly unique. There is no room for generic dishes here. This focus delivers a new standard in quality that is now a wakeup call to the restaurant industry and, for the first time in the years, the small guys are leading the way. 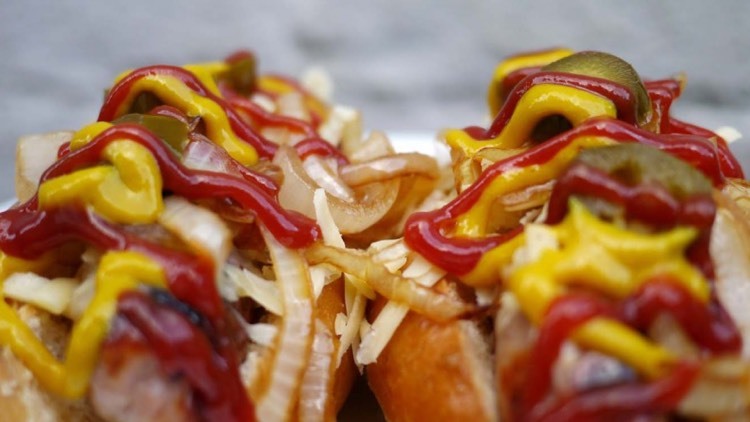 Top London restaurants, trying to keep pace, or rapidly moving to less formal environments and menus, losing the tablecloths and trying to create “posh” hotdogs, burgers and street food in their own right. So popular is the concept that some of the country’s top chefs are getting in on the act. Fish dog is Mark Hix’s take on a classic fish finger sandwich. A giant homemade fish finger, made from sustainable pollock, deep fried and served in a hot dog bun with a choice of minted mushy peas and tartare sauce. After launching at Jamie Oliver’s ‘The Big Feastival’ last summer, the food truck, a 1971 Citroen H van, has been cruising around various London markets, including Brockley market every Saturday. New companies are coming onto the market every month. With such an overwhelming choice on offer a great introduction is to try one of the organised food tours. Coutours is a company that prides itself on entertaining visitors to London as well as enlightening Londoners. Founder and MD Emma Parker explains the appeal of the street food tours. The East End tour specialises in what London does so well. The array of international food and its roots in the various immigrant populations that settled there. Emma does, of course, have her favourites among the stalls she visits. The famous RibMan, with his outdoor reared pork from Norfolk and Suffolk farms gets a special mention. As does Mother Clucker, with their tea brined, buttermilk soaked, twice battered fried chicken from their converted US Army ambulance currently housed in the Truman Brewery. She also has a soft spot for Borough market regular Richard Haward’s the Company Shed. Summing up the appeal of the street food concept to customers and vendors alike, Emma says. The London food scene has never been more exciting and, with its growing popularity, this trend is now slowly spreading across the nation. Old classics are being rediscovered, British heritage produce is finding its way back to the market, new ingredients continue to cross our shores, and the low cost to enter this market means that small entrepreneurs are finding a way to carve out their own niche in a market previously dominated by the big players and investors. The direction of food is changing, and the UK is leading way!